Sometimes you stumble across a portfolio where the artist only has a couple of comic based pieces, other times there can be just one work so brilliant, you'd risk being stoned to death by fellow art lovers for putting something else beside it. These are Random Works of Wow and illustrating the point this week is Stjepan Sejic with his Teen Titans. With NYCC having just wrapped, with hordes of young folk running around, what more fitting subject could there be for this week's Random? Sure Stjepan is currently Top Cow's greatest artistic weapon, but his online portfolio is chocka with white hot art of the Titans and Wonder Woman. Should the Cow ever lose it's grip, seeing his obvious love of DC land at DC would be a treat for fans everywhere. Of course that would mean there would need to be The Titans at DC... or at least an Aqualad. What do you think? Sound off below, click to enlarge or view more Random Works of Wow here. To see more of Sejic's style, click here. 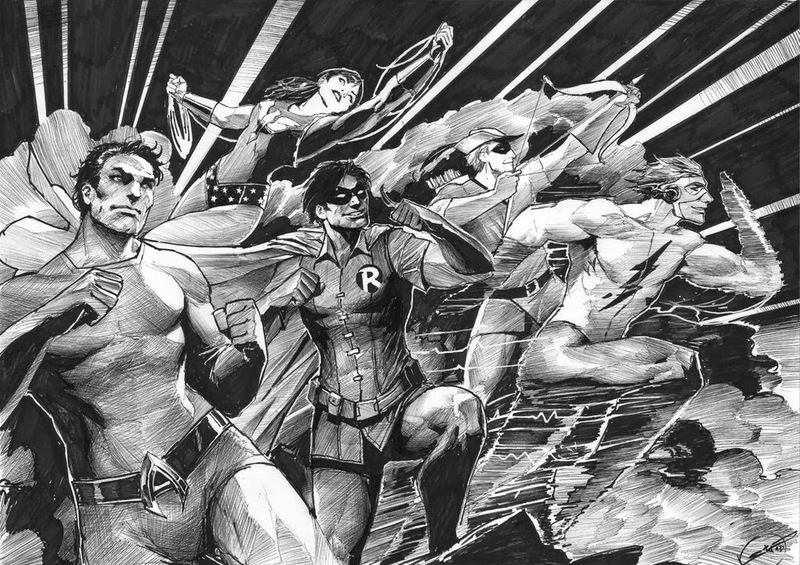 My fave Titans era comprised Robin, Speedy, Kid Flash, Wonder Girl, Aqualad, Lilith and Mal [who remembers Mal?] and the time they were working for the mysterious Mr. Jupiter. I remember Mal. :) And Karen. I love that era, but my favorite was with Cyborg, Robin/Nightwing, Kid Flash, Wonder Girl, Starfire, Raven, occasionally Lilith, and Beast Boy. DC without the real Titans is not DC, but it's not the real DC anyway. Amen. But I would have settled for Cassie being Cassie. And not Amanda Bynes on steroids. Thanks all, my top era of the Titans has to be George/Wolfman. Cliche but for a reason. Only swap Aqualad for Tempest and you are sorted. Jericho, Starfire, Raven - good stuff. Completely agree Tam - the New Teen Titans, as well as those serving on both sides of that era are the legacy generation, and that legacy is what divides DC from Marvel. Without that great stepping stone it just raises so many questions. Poor Nightwing. His continuity is missing it's most colourful part. Random - by some coincidence over on Siskoid's Blog of Geekery theyr just discussing Mal and Karen from the Teen Titans. Thanks karl! That was just what I needed. A wonderful blast from teenage angst past. I always liked Karen's beginnings as a superhero. "I'll put on a costume just so my honey doesn't fail!" Takes Stand By Your Man to a new level.